A hastily thought through dinner of roasted lamb with my own mint-almond pesto, roasted vegetables (the baby eggplant was exceptional), and cauliflower rice… Can’t get to potato without a stick blender– so it was rice. All yumm! 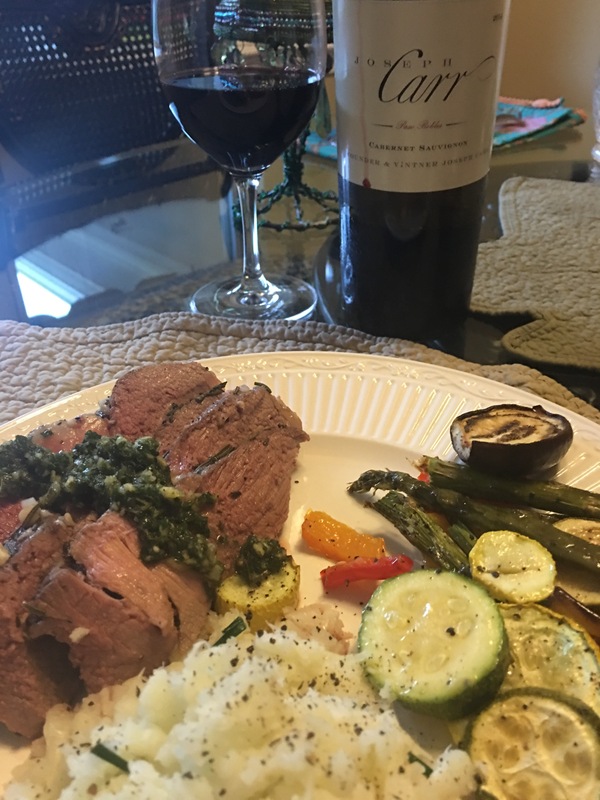 Enjoyed with the Joseph Carr 2014 Paso Robles Cabernet. Yes. Enjoyed! The pairing worked well. I live in the real world. I opened the bottle to taste it last night and today it goes well with dinner. We weren’t going to open another bottle. Thank goodness I was craving lamb. My husband was thrilled to come home and find I had cooked! !